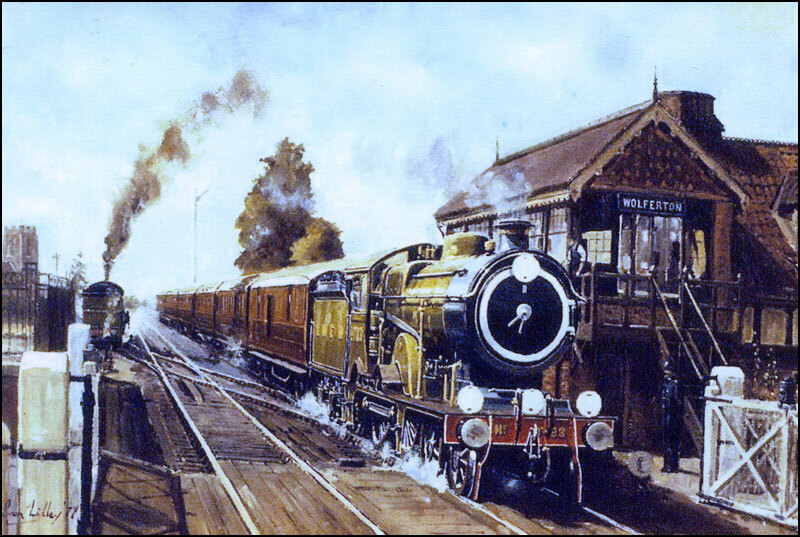 My first memory of Wolferton Station was on a Summer Excursion from King’s Lynn to Hunstanton when my Father, an M.& G.N. railwayman, pointed through the carriage window to the immaculate Royal Station and told me that this is where the King and Queen spent their holidays. To a five year old boy who was mad on trains it was simply breathtaking. The station was so perfect! I stepped onto Wolferton Station many years later when the line had closed. The station had suffered considerable neglect over the years. Eric and Herta Walker had made their home there calling it appropriately ‘Downside’ and had decided to open a museum dedicated to Royal Travel in order to raise much needed funds. They asked me to paint three pictures for display in the Royal Waiting Rooms. I painted two locomotives with royal names: (1) ‘G.W.R. No. 6001 4-6-0 ‘King Edward VII’ heading an express at Royal Leamington Spa;’ (2) ‘L.M.S. No. 6201 4-6-2 ‘Princess Elizabeth’ with an express climbing Shap’. The third painting was ‘The Royal Train arrives at Wolferton’ (shown above). Hauled by L.N.E.R ‘Claud Hamilton’ 4-4-0 No. 8783, it was one of two ‘Clauds’ painted in L.N.E.R. apple-green livery with brass-capped chimneys and retained for Royal Train working. The other, No. 8737, waits in the siding ready to haul the Royal Train back to its depot. Eric and Herta were a lovely hospitable couple and so proud of ‘their’ Royal Station Museum, which they were committed to maintaining as close as possible to the original. We became great friends. My most recent acquaintance with Wolferton Royal Station followed a chance meeting in August 2008, with Richard Brown, the current owner of the Station. Since Richard’s ownership some years ago, an immaculate restoration has taken place. With new crossing gates installed, The Royal Station including the Royal Waiting Rooms, and Wolferton Signal Box, have, under Richard’s enthusiastic and skilful supervision, undergone a remarkable transformation. It really is superb, and is a tribute to Richard’s vision and dedication, ably supported by a fine team of craftsmen.